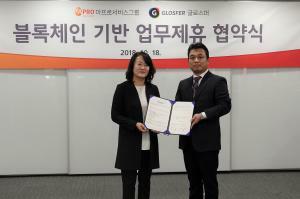 SEOUL, SOUTH KOREA, October 26, 2018 /EINPresswire.com/ -- Glosfer (CEO Taewon Kim), a first-generation blockchain company in Korea, announced that it has partnered with APRO Service Group to collaborate on blockchain-based businesses. APRO Service Group is a consumer finance company with KRW 9.3 trillion (USD 8.2 billion) in total assets, over 1.2 million customers and 14 affiliates, including OK Savings Bank, OK Capital and APRO Credit Information, as of 2018. The company has expanded to China and Southeast Asian countries including Indonesia and Cambodia. Under the partnership, the two companies will develop fintech business models using blockchain technology to aid APRO Service Group in expanding its market at home and abroad. Glosfer’s proprietary blockchain platform HYCON will be utilized to that end.